A lavish lotion for leather of any age! Boyd Coddington Vintage Leather Conditioner is an advanced formula lotion that penetrates deep in your leather surface for the ultimate condition. Natural ingredients allow you to moisturize your dried, cracked, and faded leather to restore the once luxurious feel and look. Boyd’s Vintage Leather Conditioner is safe for use on all leather surfaces and leaves behind a dry and silky smooth leather surface. Due to the natural make-up of leather used on car seats and other interior surfaces, damage and deterioration can happen quickly if that material is not already protected and conditioned using a leather-specific product. Boyd Coddington Vintage Leather Conditioner was formulated using vitamin E, perfect for nourishing and protecting leather surfaces. Many people assume leather maintenance is time consuming and tedious, when in fact, given the correct product, the opposite is true! If you were lucky enough to have perfect leather to begin with, maintenance is as easy as acquiring a quality leather conditioner. Boyd Coddington Vintage Leather Conditioner protects against UV rays and general wear and tear, with the added bonus of no leftover residue, so regular applications keeps your leather looking and feeling new. 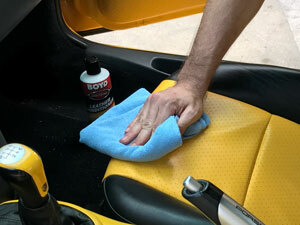 Apply Boyd Coddington Vintage Leather Conditioner using a microfiber towel or microfiber applicator. Gently massage into your leather surface for a deeply conditioned and protected leather surface! For leather that has been neglected and begun to crack, Boyd Coddington Vintage Leather Conditioner uses the nourishing oils from the vitamin E to penetrate deep into the surface, restoring the conditioned appearance. Featuring a pleasant leather scent, Boyd Coddington Vintage Leather Conditioner keeps your leather protected and your interior fresh. Leaves a pleasant smell and best of all the leather looks the way it should, not greasy and not too shinny. Easy to use and also removes surface dirt. I use it on everything in the vehicle, including plastic and vinyls. Works great on house leather furniture, and leather shoes. ProsWorks as advertised. Easy to use, little effort to buff out. Nice smell that doesnt last very long( thats a plus). Not greasy and a muted clean look.